6 P R I N T W E A R J A N U A R Y 2 0 1 9 6 P R I N T W E A R J A N U A R Y 2 0 1 9 BUSINESS WATCH Stay up to date with what's happening in the world of apparel decorating and news relevant to your business. Vapor Apparel Moves to New Headquarters HANAHAN, S.C.—Vapor Apparel announces the opening of a new head- quarters in South Carolina. "We are excited to be moving into our own head- quarters here in the Low Country," says Jackson Burnett, president of Vapor Apparel. "It is a big step for the company and will create new value for our customers." The new 26,000 sq.-ft. headquarters houses Vapor's corporate offices, production department, and fulfillment operations. The new location also features a client showroom. Aside from the physical address change, the company's phone numbers and email addresses remain the same. "Vapor Apparel has evolved over the past 14 years, and this new resource will improve our ability to scale the fastest growing parts of the business and continue to deliver a quality buying experience," says Christopher Bernat, chief revenue officer at Vapor Apparel The new hub is located at 917 Commerce Circle, Hanahan, South Caro- lina, 29410. BSN Sports Acquires B&H Sports DALLAS—BSN Sports announces the acquisition of Mountain Mesa Sports, dba B&H Sports. The Grand Junction, Colorado- based B&H is a distributor of team sports apparel and equipment for the Western Slope region of the state. "For nearly 40 years, [B&H owner] Cory Carlson and the talented B&H team have built a trusted, community- focused team sports brand that earns loyalty from customers and pride from its employees and the local com- munity," says Terry Babilla, president of BSN Sports. "This is precisely the kind of culture that constitutes an ideal fit with BSN Sports, and we expect that the combined of- fering will create an incomparable one-stop shop for the Western Colorado area." Carlson adds that he looks forward to "continuing the strong customer relationships that we have nurtured and sustained for more than three decades." Monarch Color Corporation Partners with Anthem Screen Printing Supply CHARLOTTE, N.C.—Monarch Color Corporation adds Anthem Screen Printing Supply to its distributor network. This is the latest move by the company to grow its nationwide footprint. "Anthem is a great addition to our business partnership program as they are well known for highly personalized service, knowledgeable staff, and a pas- sion for screen printing, which is what we look for in a good distributor partner," says Aaron Blank, vice president of sales and distribution at Monarch. Established in 2009, Anthem Screen Printing Supply is based in South San Francisco, California. The company offers a range of core screen printing supplies as well as equipment, education, and financing options. 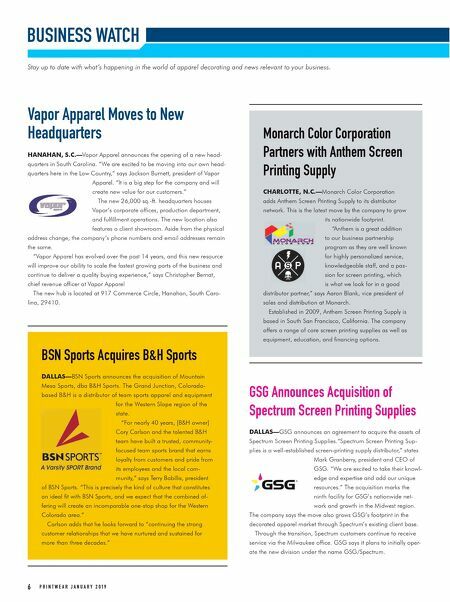 GSG Announces Acquisition of Spectrum Screen Printing Supplies DALLAS—GSG announces an agreement to acquire the assets of Spectrum Screen Printing Supplies. "Spectrum Screen Printing Sup- plies is a well-established screen-printing supply distributor," states Mark Granberry, president and CEO of GSG. "We are excited to take their knowl- edge and expertise and add our unique resources." The acquisition marks the ninth facility for GSG's nationwide net- work and growth in the Midwest region. The company says the move also grows GSG's footprint in the decorated apparel market through Spectrum's existing client base. Through the transition, Spectrum customers continue to receive service via the Milwaukee office. GSG says it plans to initially oper- ate the new division under the name GSG/Spectrum.